…and I was happier when I was apolitical. 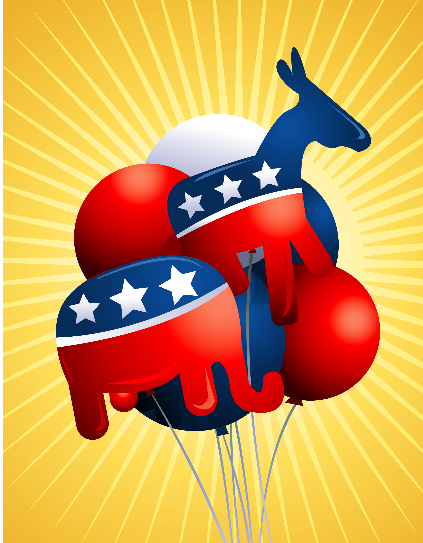 Balloons Filled with Imported Hot Air from Washington D.C.
Until 2004 I didn’t care about politics. I didn’t vote and I didn’t care what happened. I believed that my vote didn’t count for anything except in the local elections (thanks, Electoral College!). However, I came to believe that the country under Bush was worse off, and I had to take a chance to change that. I became a rabidly active voter and began to care deeply about the process. I’m rethinking that stance. Election Day is nearly over except for sweeping up the celebratory messes. Voters have been bombarded with ads for months now—both negative and positive—to the point that most people are fed up with the process. This year I decided to get “the vote” out of the way early and submitted an absentee ballot. Before voting I sat down with the Voter’s Guide published by the Dayton chapter of the League of Women Voters and did some research. You might recognize a few of these names—the “Peace and Freedom Party” have Rosanne Barr (yes, the Rosanne Barr) and Cindy Sheehan as their candidates. It really gets interesting when you look at the list of ‘Independent, Other, and Write-In Candidates without Ballot Status in Any States.’ These people depend mostly on word-of-mouth to target voters unsatisfied with all the other choices who would write their names on the ballot. Just think—you could vote for Santa Claus (his real, legal name), President Emperor Caesar, “Mad Mike” Hughes, “Sophia the Logos,” Love-22, “Mad Max” Reikse, “Average Joe” Schriner, and someone named “Da Vid.” There are a lot of normal-sounding people in this list as well but I don’t think they stand a chance. According to her website, Sophia the Logos is the sole proprietor of “Nuclear Cold-Fusion a Divine Light Energy source” that “activates and reprograms DNA.” If she’d been elected, Sophia could’ve purged the corruption in Washington’s old guard with a mass DNA reprogramming session. Think of the possibilities! 1) Don’t vote at all. Despite my belief that my vote simply doesn’t count for the presidential race, I believe it still matters in the races for Representatives, Senators, and State and local races. Withholding my vote completely will affect a much wider swath that I’d intend to do. Not to mention voting is a privilege and not a right, so you shouldn’t waste the opportunity. 2) Vote for the alternative candidates. The problem with this tack is that people other than the mainstream candidates have no realistic chance in hell of winning. If you then vote for the underdogs, you might consider your vote wasted (as I would). This would also mean that, if you didn’t like either candidate, you’ve lost your chance to elect the lesser of two evils. Keep in mind that voting for the lesser of two evils is still voting for evil. 3) Abstain from voting for those you don’t like but vote for those you do like. People who don’t like to leave things incomplete will hate this option. If there’s no competition for an office, only one choice on the ballot and you don’t like the candidate, then don’t vote in that category. This is the best move for your conscience’s sake–at least you’re not enabling evil. Well, now that the madness has passed we can all take a stress-relieving deep breath and get back to our everyday lives. At least until the next election cycle.